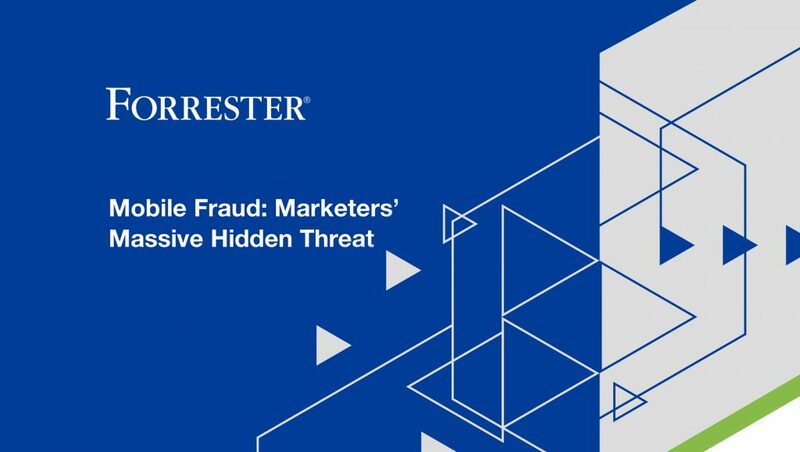 According to a Forrester Consulting thought leadership paper commissioned by AppsFlyer entitled Mobile Fraud: Marketers’ Massive Hidden Threat explores, only 1 in 5 enterprise marketers feel they are able to systematically monitor and prevent fraud. Marketers still rely heavily on legacy technologies and tools to combat mobile ad fraud and firms like an enterprise marketing software vendor (48%) and/or an ad verification vendor (38%) who are currently helping marketers, but they’re not specialized in analyzing mobile traffic or combating fraud. But there are organisations who are going the extra mile to protect themselves. Experienced greater ad campaign efficiency. 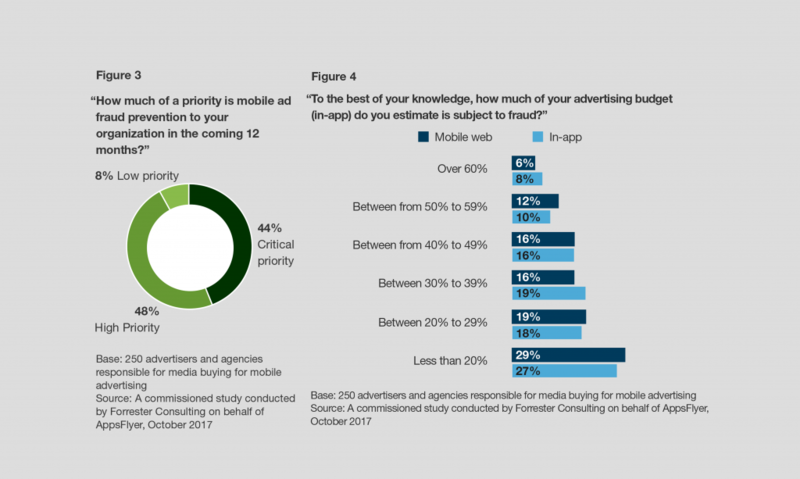 63% of advertisers and agencies said they’re beginning to see more efficiency on their ad spend when buying mobile ads. Gained better campaign insights. With accurate data, comes better insights. 60% of advertisers and agencies cite better campaign insights from improving mobile ad fraud prevention. Better campaign insights mean marketers are able to better target an individual or segment with relevant content that matches their behavior and interests. Improved ROI and engagement. Developing an understanding on what patterns can be used to identify the different types of fraud will only increase return on ad spend (55%) due to more accurate and less malicious mobile ads. In fact, accurate data results in increased engagement from the end-user (53%), which is the ultimate goal. Mobile is an increasingly important channel for enterprise marketers. 70% of the enterprise marketers surveyed for this report are increasing their budgets for mobile advertising over the next 12 months. 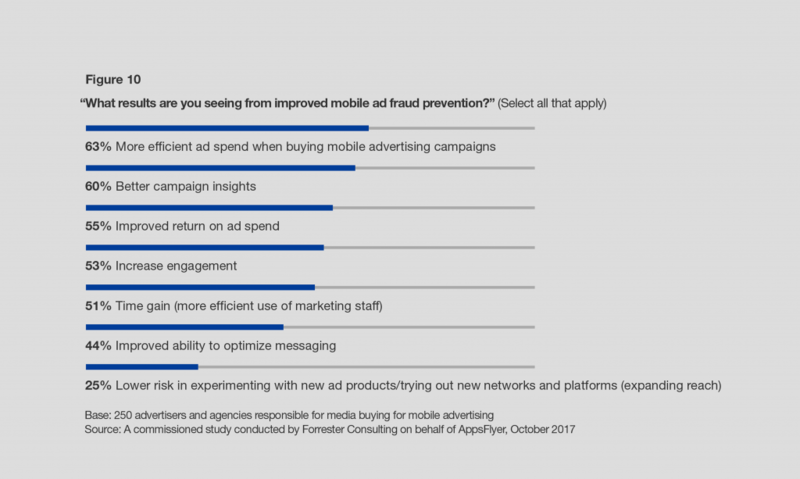 Yet despite the increase in resources dedicated to mobile, marketers acknowledge that large portions of their ad budgets are exposed and/or lost to fraud. 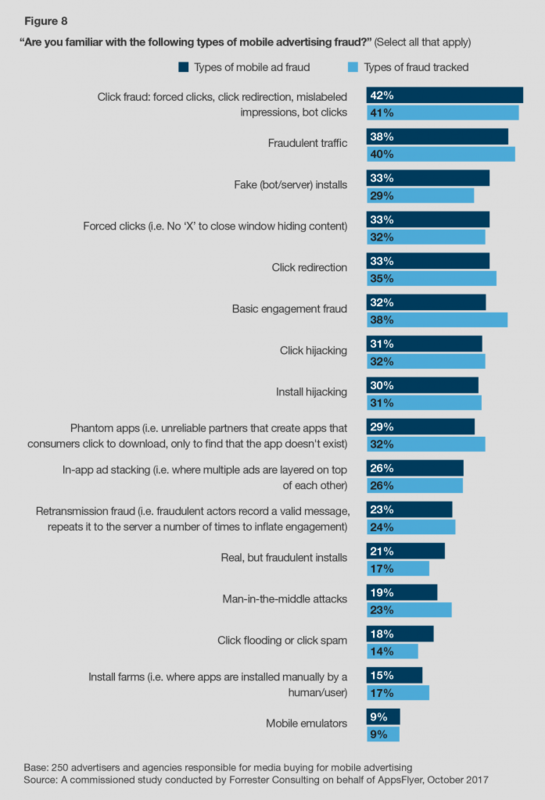 Fraud is currently accepted by the market as a cost of doing business, 69% of marketers cite that at least 20% of their budgets are exposed to fraud on mobile web and 71% for in-app advertising. Marketers cite their main challenges as being a lack of visibility into their data, a lack of knowledge about programmatic media buying which is compounded by bad actors rapidly coming up with new and more sophisticated ways to perpetuate fraud. 43% of marketers in the report cite that the amount of fraud they are subject to has increased over the last 12 months. Currently only 19% of enterprise marketers claim to have systematic fraud prevention in place. As a result of the prevalence of fraud in mobile advertising 92% of marketers who responded to the survey list combating mobile fraud as a high or critical priority for the next 12 months. Systematic fraud prevention is a competitive advantage for mobile marketers. For the minority of enterprise advertisers that do have systematic fraud prevention currently, benefits include improved ROI, better campaign insights, easier optimization, and increased user engagement. Mobile devices are fragmented platforms, where marketers have to plan ad campaigns across mobile web, apps, social networks and different operating systems. Today, the market is split between primarily two competing operating systems that function differently in terms of data capture and data sharing; Android captures 78% of the market globally and Apple’s iOS has 21% of the market share.1 A lot of that time is spent on social media apps, which are expected to attract nearly 40% of mobile advertising spend in 2018.2 At the same time, social networks are notorious for operating as ‘Walled Gardens’ which follow their own rules when it comes to reporting on usage data and makes it very difficult to measure cross platform campaigns that have touchpoints in social. When visibility is lost, the door is opened for fraudsters to operate in between the cracks of the data as consumers jump from social network to other apps or the app stores. Lack of transparency and knowledge are primary challenges facing enterprise marketers. “In the app economy, it’s not the size of the organization, but rather the popularity of the app that makes organizations targets. Many smaller organizations have built up app audiences using organic (non-paid) marketing efforts. Even with small advertising budgets, these apps are targets for fraud because of their popularity. 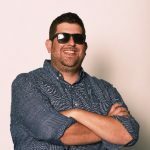 No matter what your budget is, the best strategy to combat fraud is educating yourself on the risks and utilizing your data to better understand how you might be vulnerable,” said Ari Rosenstein, Senior Marketing Director at AppsFlyer. The results of the survey among enterprise marketers show that currently only a minority (19%) have a systematic fraud prevention program in place, while 92% say that fraud is a high or critical priority for the next 12 months. Yet despite the exposure to fraud, 70% of marketers report that at least 20% of their budgets are subject to fraud and 34% claim expose of 40% or more, the majority of marketers are increasing their budgets for mobile advertising over the next 12 months and increasing their budgets. In a crowded app ecosystem, effective strategies for fraud prevention and detection pose a significant competitive advantage, which materializes in accurate campaign insights, more effective ad spend, better engagement, and ultimately in improved ROI. Educate your mobile marketing teams on the different faces of mobile ad fraud and how it impacts their performance. The challenge in fighting fraud is that very few people actually understand the tactics being used by fraudsters and how to deal with those tactics on an effective level. It is mission critical to educate marketers who pay for advertising and take the first step in fighting fraud from the bottom-up. Add independent, mobile-first tools to your arsenal of fraud detection capabilities. Advertisers will be able to transform their mobile ad campaigns with the help of business partners that have a track record, technical expertise and the relevant skills to combat mobile ad fraud. Select your inventory sources with diligence. Before beginning mobile ad campaigns, advertisers and agencies must engage with their media sources about the approach being used to combat fraud. At the same time, be aware that fraudsters tend to scale by spreading their efforts across media sources — any ad network can be subject to fraud. 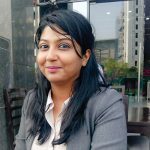 Wherever possible, work with clear definitions on what constitutes fraudulent traffic and how to resolve billing disputes. Invest in your data. 32% of enterprise marketers said they require clarity from vendors on how they combat fraud. And the number one challenge enterprise mobile face is poor data which creates an environment where fraud proliferates. Companies that overcome poor data, will be able to identify and measure fraud protection effectiveness to gain a competitive edge over the market.